For other things called "hash", see hash (disambiguation). Hash is a culinary dish consisting of diced or chopped meat, potatoes and spices that are mixed together and cooked by themselves, or with other ingredients such as onions. The name is derived from French: hacher, meaning "to chop". Canned corned beef hash became especially popular in countries such as Britain and France during and after the Second World War as rationing limited the availability of fresh meat. A common alternative is roast beef hash. In 2011, it was reported that hash was making a comeback as more than just a dish for leftovers or breakfasts of last resort, with high-end restaurants offering sophisticated hash dishes on their menus. The meat packing company Hormel claims that it introduced canned corned beef hash and roast beef hash to the U.S. in 1950, but "hash" of many forms was part of the American diet since at least the 18th century, as is attested by the availability of numerous recipes and the existence of many "hash houses" named after the dish. In the United States, September 27 is "National Corned Beef Hash Day." a Southern traditional blend of leftover pork from a barbecue mixed with barbecue sauce and served over rice. This is a common side dish at barbecue restaurants and pig pickin's notably in South Carolina and Georgia. a thick stew made up of pork, chicken and beef, generally leftover, traditionally seasoned with salt and pepper and other spices, reduced overnight over an open flame in an iron washpot or hashpot. Some areas in the South also use the term hash to refer to meat, such as wild game, that is served as barbecue or pulled meat that is boiled first. In Denmark, hash is known in Danish as "biksemad" (roughly translated, "tossed together food"), and it is a traditional leftover dish usually served with a fried egg, worcestershire sauce, pickled red beet slices and ketchup or Bearnaise sauce. The meat is usually pork, and the mixture is not mashed together into a paste, but rather the ingredients are coarsely diced and readily discernible in their cooked form. In Sweden, there is a version of hash called pyttipanna and in Finland, pyttipannu and Norway, pyttipanne. It is similar to the Danish version. The Swedish variety Pytt Bellman calls specifically for beef instead of other meats and adding cream to the hash. It is named after Sweden's 18th century national poet Carl Michael Bellman. In Austria and perhaps more specifically Tyrol, there exists a similar dish called "Gröstl", usually consisting of chopped leftover meats (often being pork sausage), potato and onions fried with herbs (typically marjoram and parsley) and then served topped with a fried egg. In Slovenia it is called ''haše'' and very often used as a spaghetti sauce. It is made out of minced pork and veal meat, potato sauce, onion, garlic, flour and spices. In Malaysia, a similar dish is called "bergedil". It is usually made with minced meat, potatoes and onions, fried until brown. In Spanish, Portuguese and Latin American cuisines, there is a similar dish called picadillo (Spanish) or carne moída (Portuguese). It is made with ground meat (usually beef), tomatoes (tomato sauce may be used as a substitute), vegetables and spices that vary by region (the Portuguese and Brazilian version is generally carne moída refogada, very heavy on garlic, in the form of an aioli sofrito called refogado, and often also heavy on onion and bell peppers). It is often served with rice (it can be fried in aioli sofrito if those who will eat have a strong fondness for garlic), as well as okra, in the form of quiabo refogado—okra fried in an aioli sofrito, just as the hash itself and the collard greens used in feijoada—, in Brazil, there constituting a staple) or used as a filling in dishes such as tacos, tostadas, or as a regular breakfast hash with eggs and tortillas (not in Brazil and Portugal). In Brazil and Portugal, it is used as bolognese sauce for pasta, and also used as a filling for pancake rolls, pastel (Brazilian pastry empanada), empadão and others (not with okra as it is far too perishable to be used in a fill for fast food and its consumption together with wheat flour-based foods often does not fit cultural tastes). The name comes from the West Iberian (Spanish, Leonese and Portuguese) infinitive verb picar, which means "to mince" or "to chop". In Germany, Labskaus is made with beef or corned beef minced with onions and boiled potatoes and fried in lard. Beetroot and herring may be added, or served as a side dish. Additionally, a sauce consisting of ground meat and served with pasta is called Haschee. ^ Food – Recipes : Corned beef hash. BBC. Retrieved on 2011-04-09. ^ Online Etymology Dictionary. Retrieved on 2012-09-28. ^ WW2 People's War – Good Comes From Evil: Part 1. BBC. Retrieved on 2011-04-09. ^ "The Humble Plate of Hash Has Nobler Ambitions". New York Times. January 4, 2011. Retrieved 2014-01-17. ^ William Porter (2012-08-21). "Hash: Think outside the can with this cross-cultural dining staple". The Denver Post. Retrieved 2014-01-17. ^ "About Hormel > Our Advertising > Print > 1950s Roast Beef Hash Ad". Hormel. Archived from the original on September 26, 2011. Retrieved July 18, 2011. ^ Hess, Mrs. Glasse ; in facsimile, with historical notes by Karen (1998). The art of cookery made plain and easy. Bedford, Mass. : Applewood Books. pp. 63, 73, 79. ISBN 1-55709-462-4. 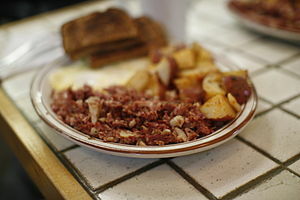 ^ "Breakfast buffet: National corned beef hash day". CNN. 2011-09-27. Archived from the original on 2011-09-29. ^ Harding, Paul; Mark Elliott; Steve Kokker; Tom Masters (2007). Scandinavian Europe. Lonely Planet. ISBN 978-1-74104-553-6. ^ Picadillo | Define Picadillo at Dictionary.com. Dictionary.reference.com. Retrieved on 2011-04-09. Wikimedia Commons has media related to Hash (food).